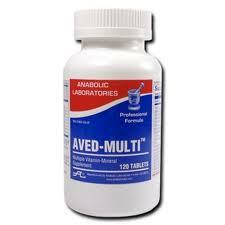 AVED-Multi is a convenient two-per-day, easy to swallow multi vitamin that is rich in vitamins A, E, C and beta-carotene with balanced B-complex vitamins that are key factors in nerve, cardiovascular and mental health. 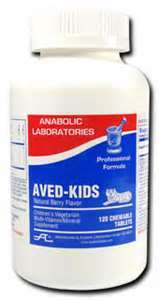 AVED-Kids is a Berry flavored chewable vitamin that provides important B-complex vitamins, 100% RDV of 11 vitamins & minerals. Gluten Free. Thymunose - Formulated to support immune response during recovery from infection and stress. In addition to the important immune boosting nutrients; vitamins A, C, zinc and selenium, each dose provides liberal quantities of thymus extract, melatonin and the newly discovered Active Hexose Correlated Compound (AHCC). These ingredients reinvigorate insufficient immune systems to fight invasive agents as normally. Probiotic Complete - Combination of upper & lower digestive track intestinal flora, Lactobacillus acidophilus and Bifidobacterium which is beneficial bacteria for essential optimal gut functioning. Just one capsule contains 4 different strains of "good" bacteria. 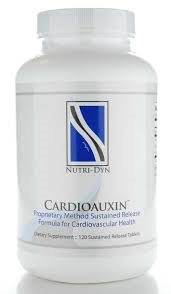 Cardioauxin - Cardioauxin is a very efficacious lipid-lowering, heart risk reduction formula. This formula contains a unique combination of synergistic nutrients that proved to significantly lower low-density lipoprotein cholesterol (LDL-C) and triglycerides (TG), while raising protective high-density lipoprotein cholesterol (HDL-C). T.R.I.-B-Plex - This is a B-complex vitamins-folic acid, vitamin B6 and vitamin B12 that helps promote health of the cardiovascular system. This complex vitamin is essential to proper energy metabolism, memory function and nerve health.